In May 2015 — one year ago this month — our family of four took a two-week trip to England, during which I gathered up an assortment of notes, photos, and memories. Over the past year, I’ve curated these into what has become a collection of anecdotes and reflections on travel, parenting, and the joy of savoring the world. Through the process of remembrance, we invite you to experience some of the quirky highlights of our trip with us. You can read the rest of the series as it develops at our England 2015 index page. Cheers! 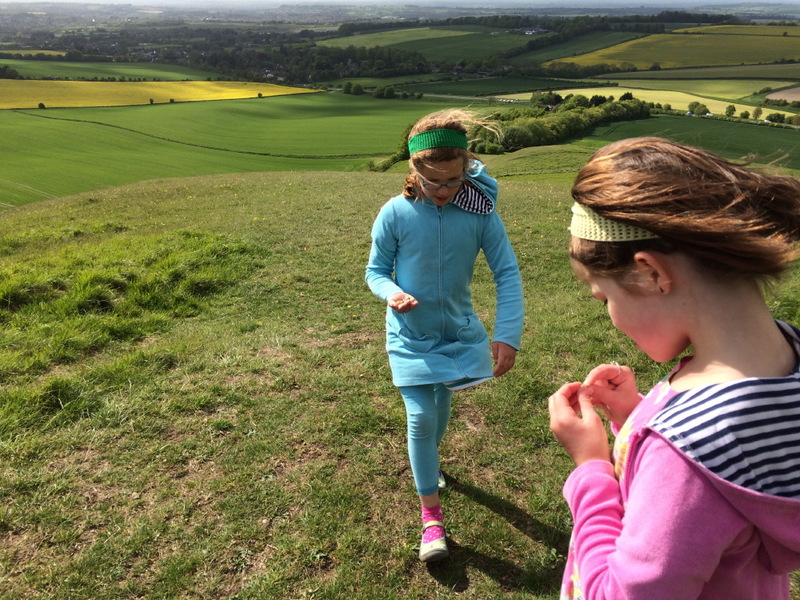 Lucy and Rosie collecting snails on a hill in Wiltshire. In June 2014, Jon and I decided the time had come to work toward making a dream become reality. “Lucy and Rosie, guess what? We’re going to go to England!” After the cheering died down, and after the girls got over their initial disappointment that we were talking about the following year rather than the following day, we began our planning process. That next year was filled with anticipation: reading English history, studying travel books about England and London, talking with Grammie and Grandpa about their trips across the pond, saving our pennies for the “London fund,” and drawing pictures of airplanes, Big Ben, and the London Eye. Oh! What hours of transport we shall spend! And when we do return, it shall not be like other travelers, without being able to give one accurate idea of any thing. We will know where we have gone — we will recollect what we have seen. Lakes, mountains, and rivers, shall not be jumbled together in our imaginations; nor, when we attempt to describe any particular scene, will we begin quarrelling about its relative situation. Let our first effusions be less insupportable than those of the generality of travelers. But, to tell you the truth — those visions of perfection got a little overwhelming. When I noticed that we weren’t absorbing our children’s English history book (H.E. Marshall’s Our Island Story) at the brisk pace I had initially envisioned, I began to soften my standards a bit. I released the girls (and myself) from the responsibility of complete comprehension and retention of British history, geography, and literature, and I settled into a more realistic goal of broad and joyful discovery. Let’s see how much fun we can have learning about England! A family portrait in front of Big Ben. It’s important for us to take [children] on as many excursions as possible, even if it’s just around the block to the local shops or to the park or the zoo, let alone to another state or country. They’ll also gather information about the world by listening to interesting adults, watching fascinating television, and learning about anything at all — from computer graphics to making pancakes, milking a cow, or playing soccer. Expanding their experience in any direction helps them to better understand how the world works. Lucy and Rosie already knew how to read, but the idea of making these connections resonated with me. I thought back to my reading on classical education, where instructors are encouraged to build “hooks” or “pegs” — through memorization, reading, field trips, and discussion — that create pathways for students to absorb their learning in a deeper, richer way. I began to understand that we needed to focus less on mastery and more on the development of our appetite for English culture. We focused on reading stories by English children’s authors for several months. Roald Dahl, of course, was already a huge favorite in our home, but we renewed our love and respect for Beatrix Potter, and we dipped into previously unknown classics such as Joyce Lankester Brisley’s Milly-Molly-Mandy and Enid Blyton’s The Enchanted Forest. We spent many happy afternoons folding laundry while enjoying travel documentaries about London and the English countryside with Rick Steeves (including one that had the unfortunate and alarming inclusion of the torture chambers of Madame Tussaud’s Wax Museum). And we developed a real fondness for tea and scones. Practicing our serious faces while waiting at yet another pub. When we finally arrived in London, I was delighted at the ways the girls were able to take those bits of ideas and put them into context. Big Ben looked different in the city than it did in drawings and pictures — but there it was! Driving on the left side of the road was really a thing, King Henry VIII had actually lived in Hampton Court Palace, and there truly are pubs everywhere. It was like watching a storybook come to life. And the hooks just keep growing. Now, a year out from that trip, when we happen upon a reference to Shakespeare or Elizabeth I or modern dance or the prime meridian or Beatrix Potter we stop and say, “Do you remember?” Yes! We remember — with joy! On the Cutty Sark in Greenwich. Read the next post in our England 2015 series: Obsessing over Shoes: Gaining self-knowledge through packing.